rejected children – Elliot Chicken – and two projects left in purgatory. The first is from a pitch I proposed to Dark Horse Comics in Fall 1998. Not long after ending my graphic designer employment there (but long enough to recover from tendonitis), I rounded together a book proposal which included character sheets like this one for Elliot, sample comics pages, and a plot synopsis. The project was turned down by the higher-ups, but if it hadn’t, it would have been my firstborn book, claiming eldest rights over Chunky. 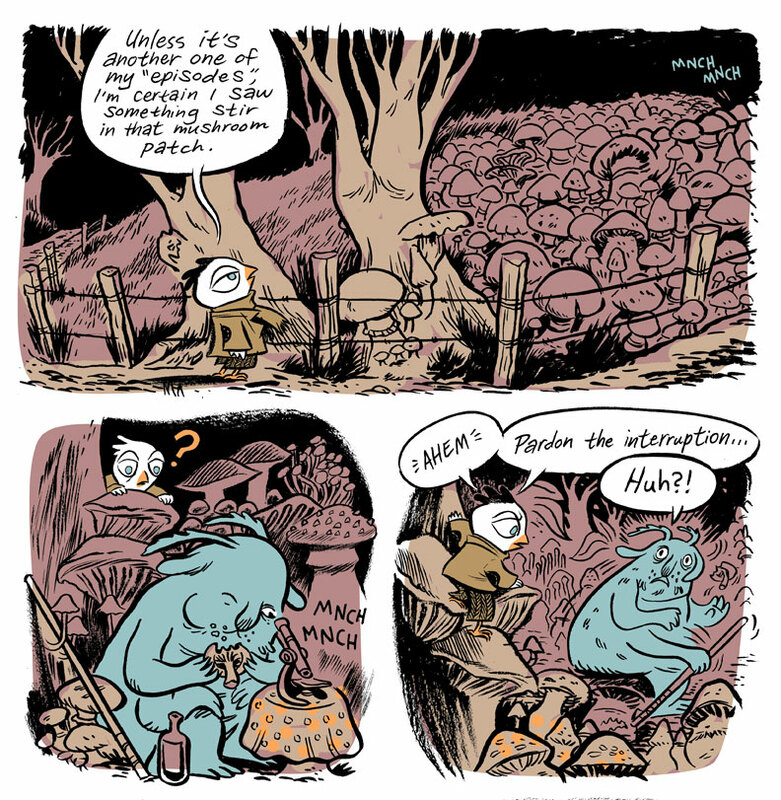 This second preview is a few panels from a jam comic my dear cartoonist buddy and Wisconsinite Aaron Renier had begun. It’s drawn “CONVERSATIONS”-style where we’d render half a panel and email it to the other to complete. I revived lil’ troubled Elliot, and Aaron created this bizarre lunk named Waterbear, and we intended to make-it-up-as-we-went-along until we had a 200 page graphic novel!!! About three pages in, we lost steam. It was probably the pressure of our bigger projects (HABIBI for me, WALKER BEAN ~coming soonish from First Second~ for him) or a blend of laziness and insecurity. It would have been a lot more fun to draw if we still lived in the same town. These sloppy colors were just slathered on to brighten the blog — Below is an untarnished black&white panel. In other news, I love reading your comments. Yoplem asked about the ROBOX story. It appeared in a Dark Horse anthology called REVEAL with “Lone Wolf 2000″ on the cover and published in November 2002. Hope your weekend’s been good, everybody! I love the way you make cute little animals look like. They remain cute but also thoughtful and deep. I guess your next character could be a monkey using monocule and smoking with pipe. You’re my greatest inspiration, when I watch you drawings my fingers start to itsch, and if it wasn’t for your book ‘Blankets’ I would probebly still be a painter. The little chicken is great, I would love to see more. As KesheR said above, I agree your characters are cute and deep. I love how they don’t feel like the classic over-surgered hyperness you see sometimes. Jam comics work best, to me, when artist are in the same room together. I couldn’t imagine doing it by way of email. Brian, we should try an email jam with one of our sister Cartoonist Conspiracy groups sometime. i agree with KesheR too. and i love your coloring, although it’s made just for this blog (it seems like you are ashamed of the way it’s colored). i like the spirits that elliot sees. i just realized i stoped to see spirits around. i used to see them everywhere… thanks for remind me. I like Elliot; I never knew a chicken could look so intelligent. Thanks for the link to Aaron’s site as well, it’s really nice. Ha! Awesome! Aaron is an awesome artist and I ate up the Secret Summer novel he made, I wonder will you guys ever grace us with a published conversation-comic? 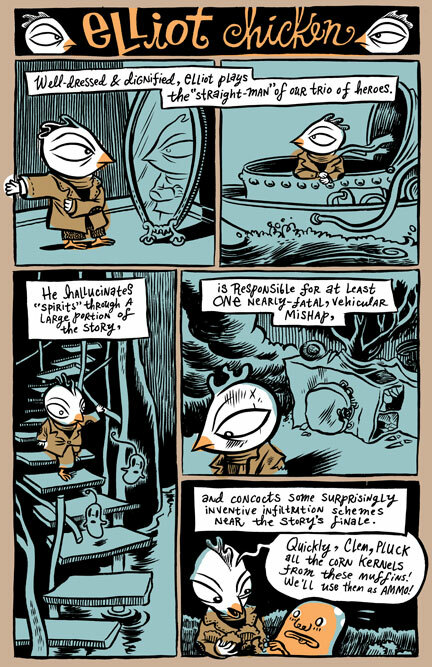 I like the ghosts in the 3rd Elliot Chicken panel. The 200 back and forth pages reminds me of my boyfriend. He wants to write a comic and have his friend in San Francisco draw it (we’re in Chicago). I’m wondering if that will take off. Aw man, words o’wisdom from the master cartoonist. I was totally inspired by your entry Mr. Thompson! I can’t agree more about the ‘finish the story’ motto Craig. I think ‘momentum’ is the greatest motor a cartoonist can have when they’re writing/drawing their comics – so if you’re continually starting/stopping – you’re effectively standing still. There are a LOT of great artists and writers out there with buzz & enthusiasm… but not many finished works. It’s a crime that you don’t print that neat Elliot Chicken story. A downright CRIME! I love seeing discarded/abandoned projects. Occasionally I go back through my own “back burner” folder…it’s amazing the stuff you find, really. The Elliot Chicken story looks especially interesting though– I hope one day you bring it out of retirement! I’m totally with you on the motivation issue. What was it that got you to stick with Chunky Rice? Are there any little secrets to keeping yourself focused on a single project that you are willing to share? I’d love to do these for Popgun Volume 3 if you’d be down Craig! Here’s my e-mail Mandrewsmith (at) gmail.com if you’d be up for it. I figured it wouldn’t hurt to ask. Yes, but this seems to be a warning more than advice! You and Aaron have art styles that go together like peanut butter and chocolate. I really want to see more collaboration! hey Craig! I was just wondering, how do you colour in your comics? Hi Craig, Iâ€™ve spend the last two days reading all your three books nonstop and â€“ although my husband warned me – I confess that Chunky of yours made me weep. I believe youâ€™re incredibly gifted and a truly sympathetic creature. I felt a strange pride when I saw my hometown â€“ Barcelona â€“ so beautifully drawn. So, for all that, Thank You. All the best. Gloria. Haha, I totally know the “running out of steam” or simply being lazy and not finishing something. But I’m working on finishing more things lately, as the most important thing for me. Thanks for sharing this cool stuff though, and I bought Goodbye Chunky Rice recently, and LOVE it!!! It’s amazing how quickly one is drawn into your stories–I totally want to know what happened next with Elliot Chicken and the Blue Mushroom Eating Dude! As others above have commented, I’m also curious–what made you finally stick with something (Chunky Rice) and see it through to the end? Or is it something you can’t really define? There is value, too, though, in unfinished work. It’s almost like a little mini work in and of itself. Thanks for sharing these little tidbits. more you and aaron! you guys are perfect together! please! the masses demand (or humbly request) it! hI Craig how are you?? I love yours books!!! Thanks for letting us into your process. It’s somehow comforting to know that even someone as great a storyteller and artist such as yourself has “secret stashes” of early works. Truly inspirational. If only I could draw and get the pictures out of my head…sigh. very nice work! I have never seen or read your comics (yet), but love what I see in the blog!